We use the latest in veterinary technology to see the big picture and identify the best treatment. 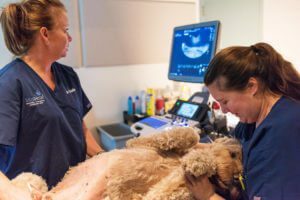 New technology offers remarkable diagnostic capability for your pet—very similar to what your doctor would use for you. Pet parents are sometimes puzzled by the number of diagnostic tests veterinarians order. You may understand what your dog is saying with a particular bark or tilt of the head, or what your cat’s meow means. But pets are like newborn babies—they can’t tell you where it hurts or when the illness began. That’s why veterinarians must rely on testing and imaging to find clues about your pet’s condition. 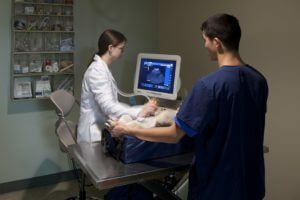 Veterinarians who spend years getting advanced training in this field may be certified by the American College of Veterinary Radiology. Our team can deploy a variety of tests to determine the best treatment for your pet and they have access to state-of-the-art equipment to verify treatment progress. Our network of board-certified radiologists can also provide your family veterinarian with imaging interpretations.